It’s that time of year when I’ve got to get a handle on cleaning up the plot of land I loosely call my garden. The tomato plants are pretty much picked clean and the peppers are gone (not that they were ever there to any great extent). My sunflowers are just a memory and the raspberry bush is just, well one big overgrown mess that needs to be pruned within an inch of its life. The one thing, however, that still keeps on giving and giving and giving are my herbs, more specifically my basil plants. 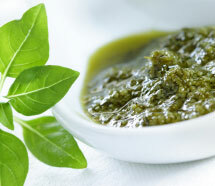 Basil is native to India and Asia and has been a part of their culinary history for more than 5,000 years. It’s also a key ingredient in a lot of Mediterranean dishes. For the most part basil plants have beautiful green leaves that give off a wonderful aroma. It’s part of the mint family and it’s an excellent source of vitamin K, iron, calcium and vitamin A. There are lots and lots of varieties of basil and some of the most popular are lemon basil, cinnamon basil, anise basil and clove basil, and opal basil, which has purple leaves, is one of my favorites. You should look for evenly colored leaves with no sign of bruising, wilting or yellowing. All fresh herbs should be carefully washed then wrapped in a damp paper towel, then placed in a plastic bag and can be stored in the refrigerator up to 4 days after it’s picked. Basil’s unique flavor allows it compliment the flavors of lamb, fish, poultry, beans, pasta, rice, tomatoes, cheese and eggs. It also really works well in conjunction with ingredients like garlic, thyme and lemon. It’s outstanding in soups, stews and sauces. It’s always best to add the fresh basil (and or any other herb) near the end of the cooking process, so they can impart their maximum flavor. Herbs tend to lose their full bodied flavor the longer they are cooked.